The member for Vaucluse addresses Woollahra residents concerning proposed council amalgamations, Wintergarden Theatre, 1983. Rosemary Irene Ashton, politician and businesswoman, was born in Double Bay on 2 April 1936, the eldest child of James Hay (Jim) Ashton of Millamolong, Mandurama, NSW and his wife, Irene Marie (nee Anderson). 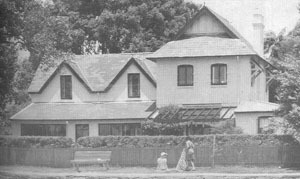 Rosemary’s birthplace, the extensive property Overthorpe in New South Head Road, Double Bay was the home of her maternal grandfather, William Anderson and his wife Lily (nee See). Overthorpe, birthplace of Rosemary Ashton. Jim Ashton (1899-1973) was a grazier and a director of pastoral companies and was already an internationally famous polo player at the time of his daughter, Rosemary’s birth. The Goulburn polo team was made up of Jim and his three brothers who took the ambitious step in 1930 of taking their polo ponies by sea to England where the team was runner-up in polo’s most prestigious event: the Hurlingham Cup. Further success in America followed while seven years later the four brothers returned to England to consolidate their reputation on the international circuit winning what would become the last ever tournament played at Hurlingham. During World War II, Jim Ashton served on the board of the Commonwealth Bank of Australia and during the 1960´s held the position of Chairman of both the MLC Insurance Co. Ltd and the Peninsular and Oriental Company of Australia Pty Ltd. (P & O). Rosemary remembers her mother as the gentle influence on her childhood years and her father as the disciplinarian. Various members of Rosemary’s family had served in the NSW parliament during the nineteenth and twentieth centuries. Her maternal great-grandfather, Sir John See (1845-1907) represented the seat of Grafton in the Legislative Assembly from 1880 until retirement in 1904. As Premier of NSW from 1901-1904 he presided over the passage of the NSW Women’s Franchise Act (1902) allowing women to vote in state government elections. This was a first step towards enabling women to stand for membership of the Legislative Assembly as his great-granddaughter would do three-quarters of a century later. Rosemary’s paternal grandfather, the Hon James Ashton (1864-1939), devoted 40 years to NSW parliamentary service in a career that embraced both houses of parliament. On the issue of trade between the states, Sir John See was a ‘protectionist’ and James Ashton a ‘free-trader’. Rosemary has commented that these distinctions represented the extent of the political divide at that time. Beyond his parliamentary service, James Ashton contributed in the fields of law, banking, commerce and pastoral development. Foot has also cited, as pivotal to her career and undertakings, the influence of her maternal grandfather, William Aloysius Anderson. He encouraged her interest and furthered her knowledge of portfolio investment thus bearing out his belief in the participation of women beyond the home. Rosemary Ashton’s early childhood was spent on her father’s property Millamolong. Riding was not only a favourite pastime but an activity fully encouraged by her father and one which occupied much of her day beyond the schoolroom. Three siblings followed her birth : Joan , James William and Wallace. The children received their initial education together, via Blackfriar’s correspondence lessons under the direction of a governess. In adult life, Rosemary’s brothers pursued pastoral and polo interests. Joan, a town planner and eco tourism operator, married George Masterman whose role as NSW Ombudsman coincided with his sister-in-law’s period in the New South Wales Legislative Assembly. From the age of 11, Rosemary’s time was divided between boarding school and Millamolong with her years of secondary education spent at Frensham, Mittagong. At Frensham, Rosemary received life-long inspiration from the words of Winifred West, the founder of the school, who advised her protégées : “Another human want which is felt by people who are really alive is the need for sharing actively in the life of the community”. This dictum has shaped Rosemary’s adult life. After matriculating, Rosemary studied at the University of Sydney from 1954 to 1956 for her Bachelor of Arts, while a resident of the Women’s College. She has contrasted the university life of the mid 1950s with what it would become over the decades that followed. Radical student political action was unknown to her peers and neither was the influence of the feminist movement yet felt. Rosemary was awakened to feminist thinking some years later, in the early 1970s, when writers such as Betty Friedan began to interest her and challenge the social structure which had shaped her life to date. Nevertheless, Rosemary enjoyed the social and intellectual life of the college arena continuing the philosophy of participation imparted at Frensham. Rosemary Foot has described her upbringing as a privileged one, noting that at twenty-five she was very much a product of her background, but that by forty, her experience had broadened considerably. After graduating from university, Rosemary Ashton worked for the ES and A Bank in the emergent field of public relations. At this time, she recalls that opportunities for women in the corporate arena were all but non-existent but during and following the end of her first marriage, she tested her success in the financial world as an investor and worked in a voluntary capacity for several health-related organisations. In 1972, Rosemary Foot joined the New South Wales division of the Liberal Party and in 1978 contested and won the NSW electorate of Vaucluse. She was the first Australian woman to be endorsed by a major party to contest an acknowledged ‘safe’ seat. During her first election campaign, Foot was to feel the burden of being a pioneering woman candidate in a conservative electorate, an obstacle which lessened in subsequent elections as she won the respect and support of her constituents. She was to successfully contest the seat twice more, in 1981 and 1984, increasing her majority at each election. Entering parliament in 1978, Foot found herself one of only two women in the Legislative Assembly. It was an aggressively masculine environment and Foot was at times the victim of both intentional and unintended sexism from both Liberal and Labor quarters. Attempts to undermine her with ‘subversive gallantry’ were ineffectual but offensive. After the death in 1980 of Mary Meillon, the member for Murray, Foot was for some time the only woman in the Legislative Assembly. While she refused to be isolated, her role was sometimes a lonely one by its nature. Undaunted, she enjoyed a rapid rise within her own party, appointed shadow spokesperson on Youth and Community Services in July, 1980, to which shadow portfolio she added Health in May, 1983. During her seven and a half years in the Legislative Assembly, she also held the shadow ministries for Employment, Consumer Affairs and Women’s Interests and, again, Health and Women’s Interests. Citizenship Ceremony, Redleaf, 1983. 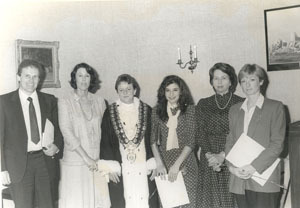 Rosemary Foot (second from right) is photographed with Woollahra Mayor Alderman Judy May, and new citizens. On 15 March, 1983 Foot was elected Deputy Leader of the Opposition – the first woman to hold a leadership position in the history of either major Australian political party. This gave her several opportunities to make further history as the first woman in NSW politics to lead the Opposition, acting in the role in January, 1984 and June, 1985 while the then Leader, Nick Greiner, was on leave. During the first of these periods as Acting Leader, Foot vigorously opposed the State Government’s proposed sale of ‘choice foreshore land’ in Vaucluse to wealthy land owners at a ‘bargain basement price’. Foot was given the opportunity to promote and serve the interests of her local constituents on various occasions and rose to the challenge, campaigning hard for improved transport services, the provision of local youth centres to combat lawlessness and under-age drinking, better facilities at Double Bay Public School and new accommodation for the Waverley Woollahra Arts Centre when this facility was threatened with closure. She was a vocal critic of the inadequacy of the ocean-outfall sewage disposal system and its affects on eastern suburbs beaches, a situation which was both a local public health issue and a matter for broader concern. 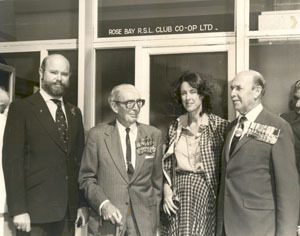 Attending an Anzac Day commemoration at Rose Bay, 1981. A newspaper article in 1984 described Foot as putting in a 90 hour week, and taking up unpopular causes – such as arguing the need for changes to the ‘inhuman’ definition of mental illness proposed in the 1982 Mental Health Act. She was not afraid to stand her ground in the belligerent atmosphere of the NSW ‘bear pit’, saying to her detractors upon her resignation that she ‘gave as good as she got’ – a claim with which various adversaries publicly agreed. While her party was in opposition for the entire time she was in parliament, Rosemary Foot avoided becoming personally demoralized by these circumstances by making hers an active career. She excelled in the house at question time, drafting well-researched and incisive queries which not only earned her respect as a politician but frequently brought about results. On 10 February, 1986 Foot resigned from parliament at 5.00pm, taking the Leader of the Opposition, Nick Greiner by surprise. Following her resignation she joined David H Burnham and Associates, a London based firm of management consultants specialising in government, social and economic planning. She brought to this role, among other attributes, her specialist knowledge of permanent part-time work. Rosemary remained in England until 1988. While Foot never resumed a parliamentary career, she soon returned to active participation in public life. Since 1990, Rosemary has served on the boards of numerous voluntary organisations as well as a number of State and Commonwealth advisory bodies. He singled out for comment as her achievements: [that she] ‘pioneered the concept of permanent part-time work, gave first-class representation to the people of Vaucluse and handled the difficult shadow portfolio of health with flair and competence’. After spending some time travelling in Europe and England, Rosemary married Sydney lawyer and businessman Robert Poynton Foot whom she had first met at Sydney University in 1955. Her early married life was spent in Melbourne where she recalls corporate dinners at which conversation between the sexes was rigidly segregated because of the conventions of the business world. Two daughters, Catherine and Charlotte were born to the couple who divorced in 1972. Both her daughters attended Ascham School at Edgecliff. Rosemary’s maternal grandfather and mentor, William Anderson died in 1967 and her father, Jim died in St Luke’s Hospital on 24 June, 1973. He was survived for the ensuing thirteen years by his wife Irene, who also died at St Luke’s Hospital on 3 November, 1986. Rosemary, who was living in England at this time, returned to Sydney to present a tribute at her mother’s funeral at St Marks Anglican Church, Darling Point, alongside her brother James. She returned again in May 1987 to preside over the sale of the family home Tueila in Double Bay- owned by the Ashton family for over eighty years. In 1990, Rosemary married her second husband, Dutchman, Bernard A J Arens who died in September, 2000. During their marriage, Rosemary commuted weekly from Bellevue Hill to Bernard’s property Tanglewood, Ourimbah on the New South Wales Central Coast. While raised and schooled in rural districts of NSW, Rosemary has strong, long-term family connections with the Woollahra municipality. Her father, Jim Ashton had been born in the suburb of Woollahra in 1899, after which her grandfather James purchased Hulverstone Villa,a mid-nineteenth century cottage standing on the Double Bay waterfront which the family enlarged to form a substantial house re-named Tueila. Here James and his wife Helen lived from the time of his purchase in 1903 until their deaths in 1939, after which the property passed to Rosemary’s parents who eventually made it their home. 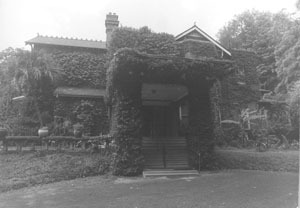 A further family tie to the Woollahra area had been created with the 1915 purchase by William Anderson, Rosemary’s maternal grandfather, of Overthorpe, a landmark property in New South Head Road which became home to Anderson and his wife Lily from that time. Rosemary’s mother was married from Overthorpe in 1935 and Rosemary was born at the house the following year. Time in Sydney during her childhood and youth was thus divided between these two houses : ‘top of Bay Street, bottom of Bay Street’ as she has summarised the proximity. 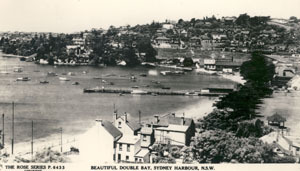 Postcard view of the Double Bay shoreline setting of Tueila. Neither family home has survived - a point of considerable sadness to Rosemary, as well as a loss to the heritage of Double Bay. William Anderson held Overthorpe until his death in 1967. When the house was demolished for an apartment complex in the 1970s, the grounds were preserved as a condition of development, a testament to their horticultural and aesthetic significance at a time when heritage value was only just beginning to be appreciated. Tueila remained in Ashton family hands until 1987 when Rosemary and her three siblings sold the house following the death of their mother. A later owner demolished the house in 1991. Having lived for over forty years in Victoria Road, Bellevue Hill, Rosemary Foot has made the Municipality of Woollahra her Sydney home throughout her adult life. First hand acquaintance with the benefits and problems of life in the eastern suburbs has allowed her to serve its residents well in a variety of roles, most notably as their local member of parliament. As the first and so far the only woman to hold the state seat of Vaucluse (1978-1986), Rosemary Foot has been uniquely placed to contribute through her political voice to the welfare and interests of Woollahra residents. During her time as a representative of the people of this district she campaigned energetically on a range of local issues. Beyond her parliamentary representation, Rosemary Foot has also worked at ‘grassroots’ level for the people of the local area, both in the municipalities of Waverley and Woollahra. She served as President of the Vaucluse Conference of the Liberal Party from 1995-1999 and also as a member of the Woollahra Action Committee. In 2005, she was appointed to the board of Sculpture by the Sea which annually hosts a free-to-the-public exhibition on the coastal walk from Bondi to Tamarama. This involvement reflects Rosemary’s strong and long-held interest in fine arts. Rosemary has recently stood down as Chair of Sculpture by the Sea while remaining on the Board. For many decades, Rosemary has belonged to the Royal Sydney Golf Club, the Rose Bay Surf Club and the Queens Club, Sydney. 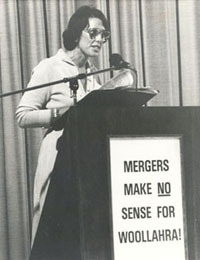 A number of organisations serving the broader community have profited from Rosemary Foot’s involvement : the NSW Association for Mental Health, Sydney Home Nursing Service, Australia Council, Law Foundation, Australian Institute of Political Science, NSW Tourism Commission, National Trust Conservation Fund Advisory Board, Eastern Sydney Area Health Service, Royal Hospital for Women Foundation, Library Council of NSW, CARE Australia and the Australian Heritage Commission. Some of these organisations are directly concerned with so-called ‘women’s issues’ and benefit the local as well as the broader community. At an international level, she has also been a director of Art/Omi (New York) from 1992 until 1986. During this period she was one of three private sponsors to select Australian sculptors for participation in Art Omi’s international artists’ workshop in upper New York State. As a role model for young women, Rosemary Foot has achieved a number of notable firsts. The most outstanding of these was her election to the Deputy Leadership of the NSW Opposition in 1983; the first woman to assume this role and the first woman in Australia to be elected to a leadership position by a major political party at either State or Federal level. Foot has long been a campaigner on women’s issues. The lobby groups with which she engaged before entering politics were largely committed to matters of particular concern to women: the problems of mental health patients and their families, childcare reform (with the emphasis on the crucial early years of a young child’s life) and the establishment of permanent part-time work as a viable third option within the Australian workforce. As the greatest single achievement of her time in parliament, Foot cites the introduction of permanent part-time work, in which she played a major persuasive role “softening up public opinion” as much as arguing its merits in the Legislative Assembly. Rosemary Foot’s award of the Order of Australia Officer in the General Division (AO) in 1999 for “services to the community in the areas of health, visual arts, women’s interests and politics” is a reflection of all she has strived for and achieved in her professional life, both as a politician and beyond. Ackland, Richard “The Odd couple” The National Times 18.3.1983 p.6. Australian Dictionary of Biography vol VII pp110-111, vol XIII, pp 80-81. Barrowclough, Nikkie “Rosie” Sydney City Monthly (February 1982) pp 42-49. Hancock, Ian The Liberals : a history of the NSW Division of the Liberal Party of Australia 1945-2000. Syd., Federation Press, 2007. Sydney Morning Herald 16.6.1983 p. 2; 19.12.1985 Style Section p. 1. 11.2.1986 p. 1. Wentworth Courier 5.6.1985 p. 1012.2.1986 p. 3; 19.2.1986 p.16; 8.10.1986 p.27. Woollahra Local History Centre vertical files – residents; state government.